Swedish summerhouses are iconic. You know, the red cottages set next to a lake or the ocean where many Swedes spend their summers. 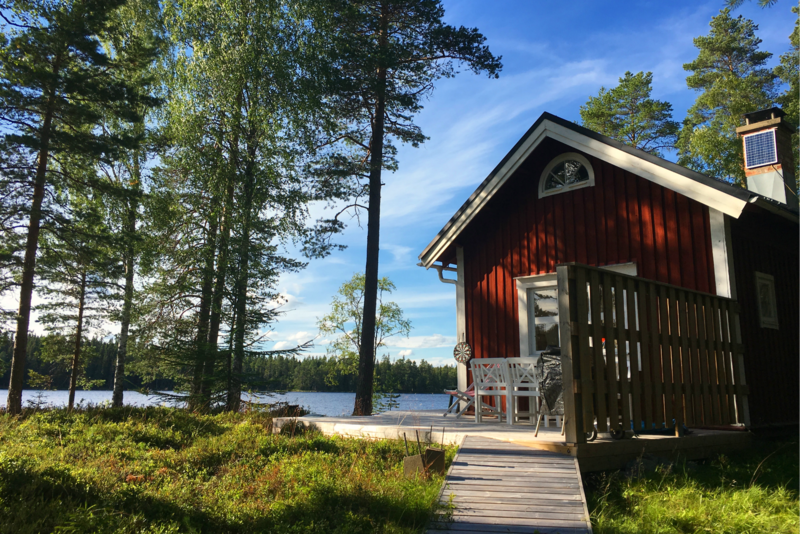 The tradition of relaxing at a summer cabin is a long standing tradition in Sweden, a country filled with nature lovers. Of course, we wanted to get a little Swedish summerhouse action while we were in Sweden, but I didn’t really think it would happen. Fortunately, we ended up with the best Airbnb hosts ever. 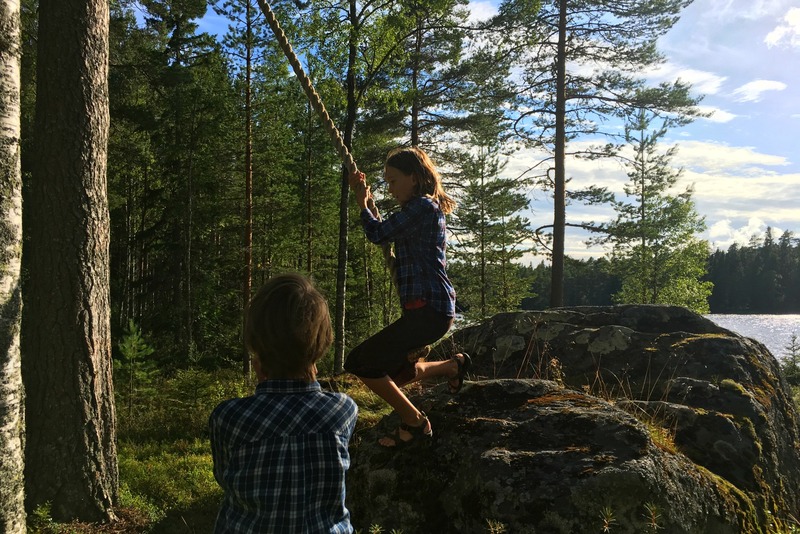 Not only did they invite us to their home in Umeå for lunch and fika*, but they had us out to their summerhouse for an evening of eating outside, picking blueberries, rope swinging, and general relaxing fun. *Fika: The Swedish tradition of drinking coffee in the afternoon, sometimes with a piece of cake or a cookie. I sub tea for coffee and it seems to work just as well. 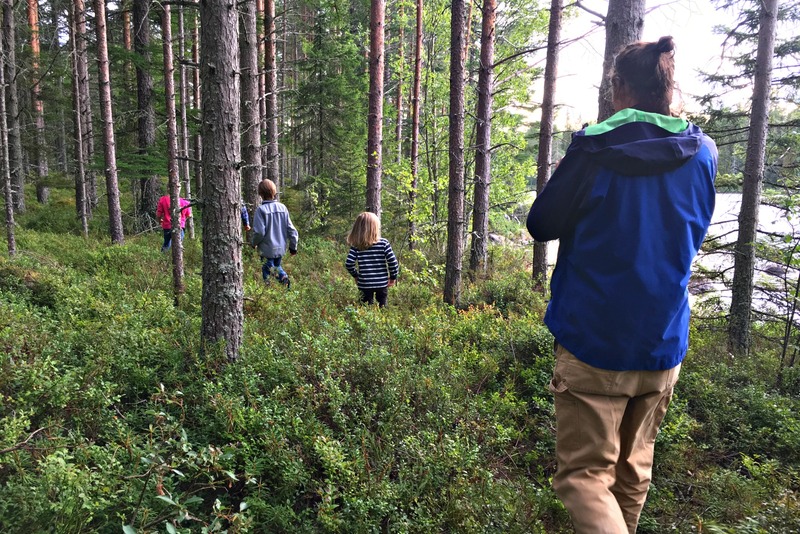 Lars and Maria and their two kiddos, drove us out to their sommarhus about 15 km from Umeå on a weekday evening. Because this is Sweden, they had most of the summer off of work. Legally, every company has to give their employees three weeks off during the summer. Maria had more time off, left over from her 400+ days of maternity leave. 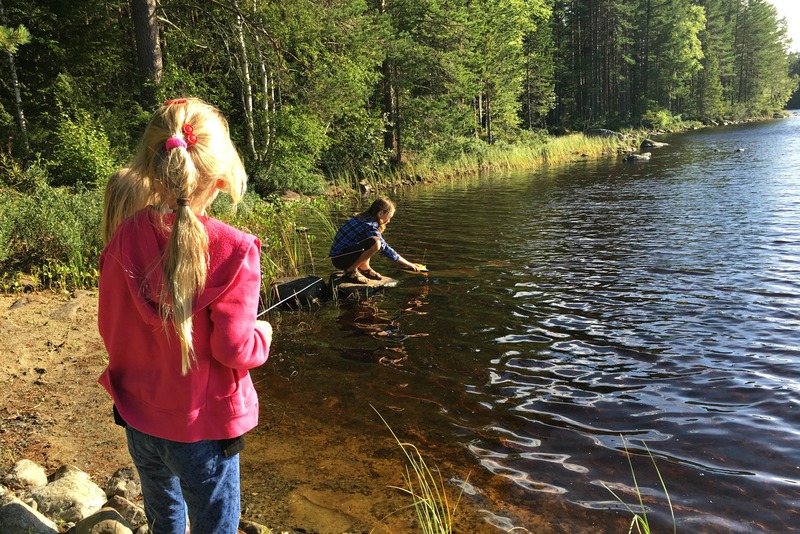 Summer is short, but the days are long in Sweden, so the Swedes take full advantage of the sunshine. The summerhouse provides a place to hang out during all those mandatory days off. Historically, the cottages were without water or electricity, but these days more and more people are hooking them up and spending more than just the summer in them. Lars and Maria’s summerhouse is still electricity-free, but they do have a small tank of water for washing dishes, but no plumbing. And there’s an outhouse. 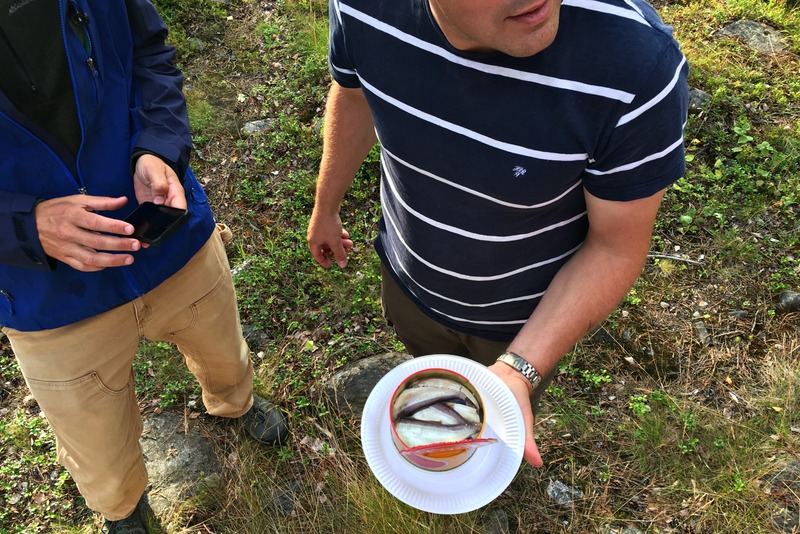 One of the highlights of our afternoon and evening at the summerhouse was trying the traditional fermented herring – Surströmming. I say it was a highlight because it is fun to take part in a cultural tradition. Not because it was good. It’s basically rotting fish that you can only serve outdoors because the odor is so bad. 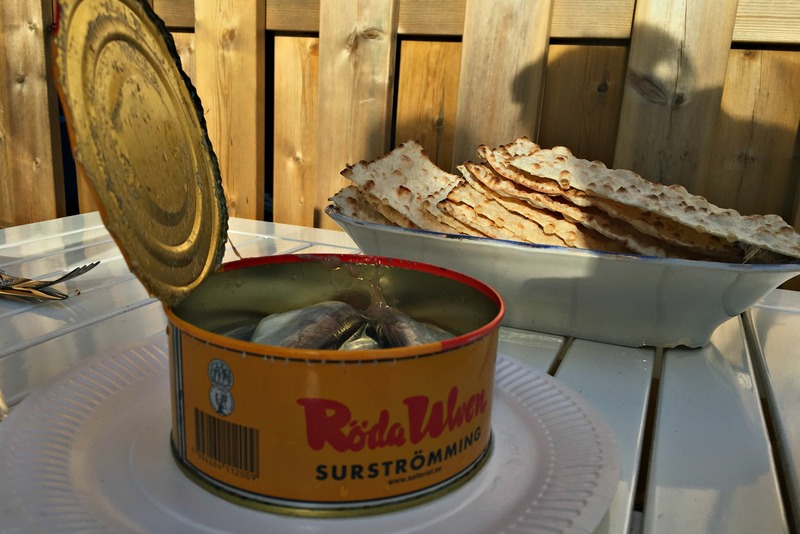 The surströmming festival happens in August when the fish is at its “best.” We deboned our little buggers, scraped the meat off the skin, and chopped it into tiny pieces. 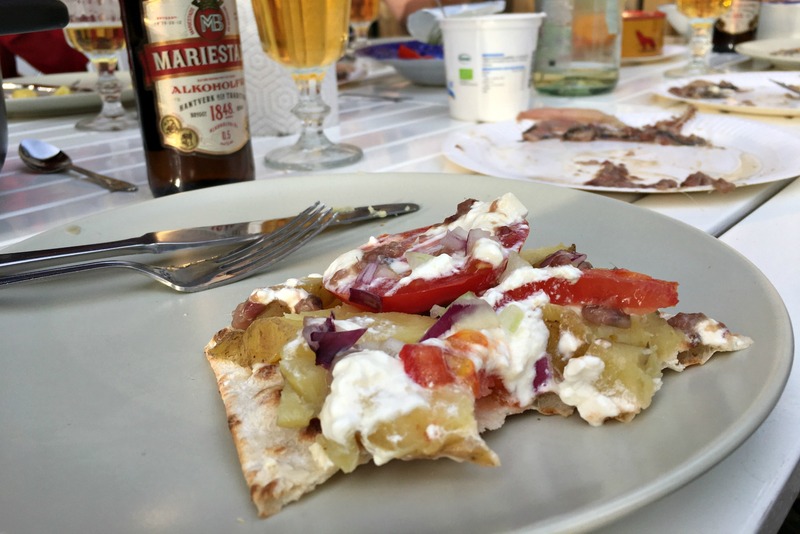 Then we spread it on crisp bread with potatoes, onions, tomatoes, and sour cream. I think all the other ingredients are meant to tone down the herring. It wasn’t my favorite Swedish food (hello, pepparkakor! ), but I am glad we tried it. 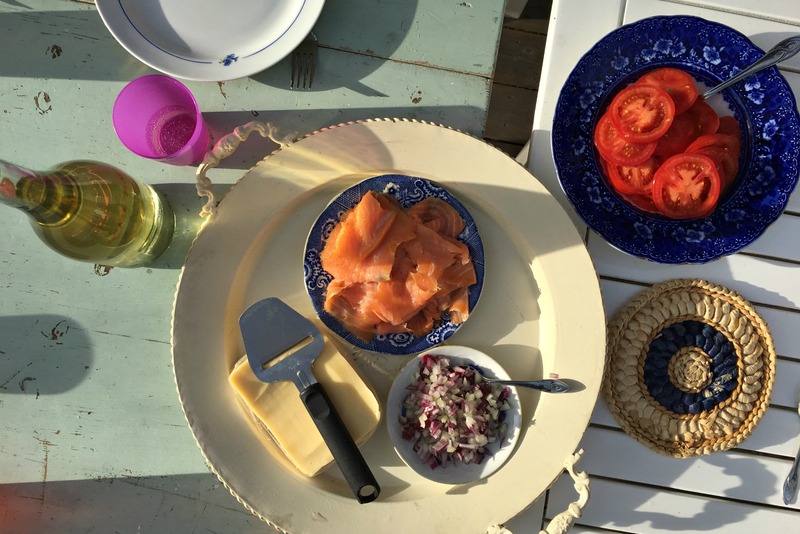 Smoked salmon, cheese, and other non-herring delights were on the menu. Our evening also included swinging a long rope tied to a tree branch. I am pretty sure Anders got in over 100 swings. 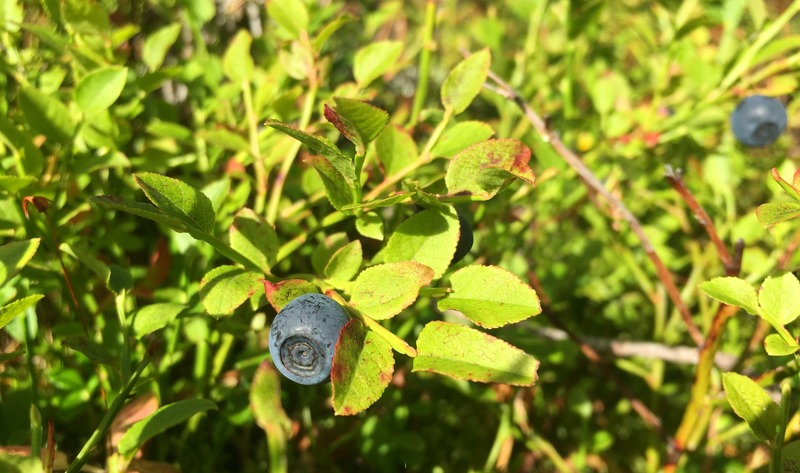 All the kids played with remote control boats in the lake, I picked a lot of blueberries, and we all enjoyed hanging out with our new Swedish friends. Thanks! It was a lovely evening. What a lovely summer tradition! I’m not so sure about the fermenting herring (!) but everything else sounds SO idyllic! I want to go there! Ha ha! It was…interesting. But, fun to try it once! 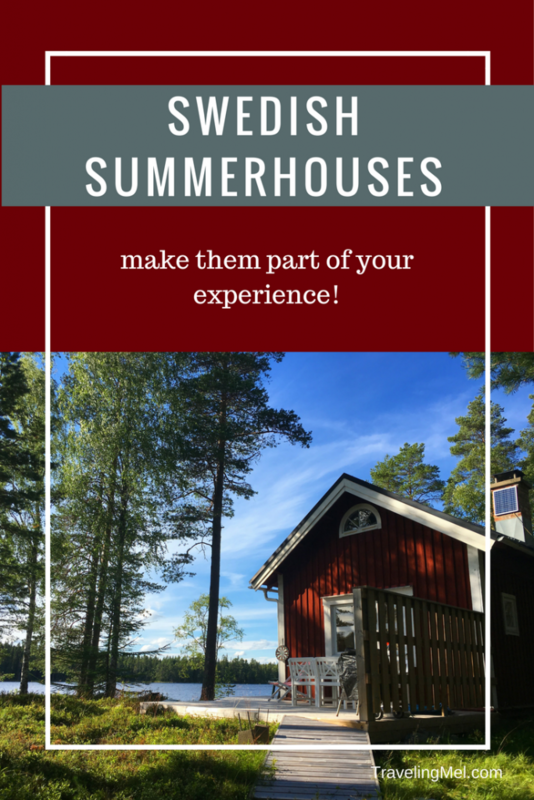 These summerhouses are all over Sweden! Hope you make it to rural Sweden soon. We had something similar in Poland and I miss it! My friend just spent the summer in Sweden visiting her family and they were at a summer house as well for most of the stay. 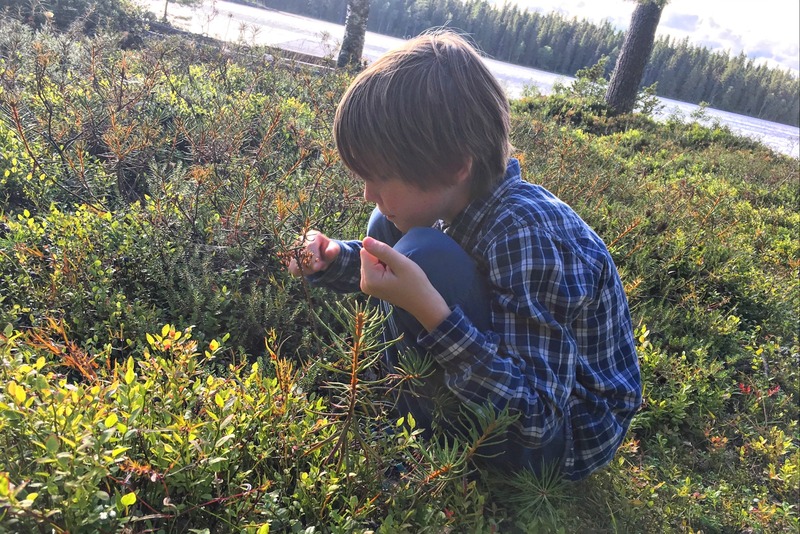 So awesome for the kids to explore the outdoors and nature for the summer! It’s such a perfect custom and seems like it is exactly how summer should be spent. Staying in a Swedish summer house sounds dreamy! I can understand why the Swedes have dedicated a space to enjoy a short summer with long days. I would love to experience fika (any excuse to have tea/coffee and cake/biscuits)! The swing also could keep me busy for a couple hours. Looks like the perfect place to do a digital detox too! Mmmm…. fika is pretty great — caffeine and sugar! The whole experience was indeed dreamy. 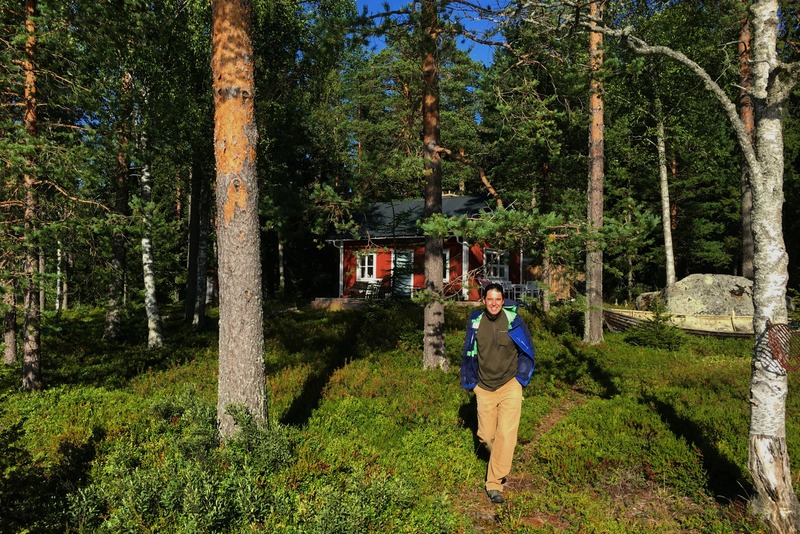 Visiting the rural part of Sweden would be an experience on its own but being able to hang out at a Swedish summerhouse seals the deal! It looks so peaceful and definitely a way to “unplug” for a while and get closer to nature. The outhouse would definitely take getting used to though. Yes, if you aren’t used to using an outhouse it is a bit different. This one is pretty nice, though! We didn’t stay there, but I am sure you could find some to rent. It would make for a lovely stay. Part of my ancestry is actually from Sweden, so this was really interesting. I remember how much my Grandma loves pickled herring & said she would have it around Christmas time with her daddy every year. I will be using Airbnb for the first time this September & I’m excited yet scared. I finally decided to take the plunge and try it out in Prague, so this looks like it was the BEST Airbnb around! I mean the photos you took were amazing and look so comfortable and homey and just my kind of setting for a perfect vacation. Your little boy is SO ADORABLE! We’ve been using Airbnb and VRBO since October and stayed in around 15 places. We’ve had nothing but good experiences! This must have been a really memorable experience. I like the lake and the surrounding greenery – a lovely place to relax and unwind. I am sure we will think back on this for a long time! Wow this must be a lot of fun. I love nature and am a sucker for places like this. Those pictures are lovely. I am surely going to save this for the future! It was a really fun evening. Hope you get to do something similar. I guess the summers at Lake Geneva were a throw back to your Swedish roots! Summer in India is over 40 deg C… its awesome to see such green summers in Sweden. I would love to spend a week in a cottage close to nature. I love the Swedish saunas too … wish my cottage has one! My only regret is that we didn’t sauna in Sweden! You definitely loved the #ropeswing!